TAKE HIGHWAY 1 SOUTH INTO RALEIGH TO THE I-440 WEST EXIT ONTO I-440 W / US-1 S /I-440 WEST. TAKE I-440 WEST TO THE SIX FORKS ROAD NORTH EXIT (EXIT #8-B). GO ABOUT ONE MILE, TURN LEFT ON W. MILLBROOK ROAD. GO FEW YARDS TURN RIGHT ON CHESHIRE PARK . FIRST BUILDING ON THE LEFT IS #318; LAST SUITE ON THE LEFT IS #113 (HRS). TAKE I-40 WEST INTO RALEIGH TO THE I-440 WEST EXIT (EXIT # 301, US 64-E/I-440 W). MERGE ONTO I-440 W (WEST). ONCE ON THE BELTLINE, TAKE THE SIX FORKS ROAD NORTH EXIT (EXIT #8-B). GO ABOUT ONE MILE, TURN LEFT ON W. MILLBROOK ROAD. GO FEW YARDS TURN RIGHT ON CHESHIRE PARK . FIRST BUILDING ON THE LEFT IS #318; LAST SUITE ON THE LEFT IS #113 (HRS). TAKE HIGHWAY 64 OR HIGHWAY 264 TO HIGHWAY 64 WEST TO THE (I-440 WEST. TAKE THE I-440 WEST EXIT. ONCE ON THE BELTLINE, TAKE THE SIX FORKS ROAD NORTH EXIT (EXIT #8-B). GO ABOUT ONE MILE, TURN LEFT ON W. MILLBROOK ROAD. GO FEW YARDS TURN RIGHT ON CHESHIRE PARK . FIRST BUILDING ON THE LEFT IS #318; LAST SUITE ON THE LEFT IS #113 (HRS). TAKE I-40 EAST INTO RALEIGH. TAKE THE WADE AVE EXIT (ONE EXIT PAST HARRISON AVE EXIT). GO UNDER THE OVERPASS AND EXIT ONTO RAMP. MERGE ONTO I-440 E / US-1 N ONCE ON THE BELTLINE, TAKE THE SIX FORKS ROAD NORTH EXIT (EXIT #8-B). 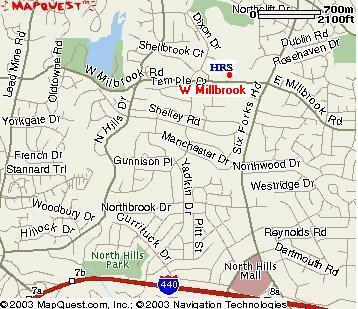 GO ABOUT ONE MILE, TURN LEFT ON W. MILLBROOK ROAD. GO FEW YARDS TURN RIGHT ON CHESHIRE PARK . FIRST BUILDING ON THE LEFT IS #318; LAST SUITE ON THE LEFT IS #113 (HRS). STAY STRAIGHT ON US-1 BYPASS NORTH INTO RALEIGH. STAY STRAIGHT ON US-1 N/I-440 EAST /US-64 E. TAKE THE SIX FORKS ROAD NORTH EXIT (EXIT #8-B). GO ABOUT ONE MILE, TURN LEFT ON W. MILLBROOK ROAD. GO FEW YARDS TURN RIGHT ON CHESHIRE PARK . FIRST BUILDING ON THE LEFT IS #318; LAST SUITE ON THE LEFT IS #113 (HRS).